You all know that every national flag but Nepal's is rectangular. Most coins are roundish. These are some old norms. Has there been any banknote that was not a solid rectangle when issued? Regular banknotes, issued in "normal times" and made from paper are practically all rectangular and without holes. But there were a couple of times when people remembered that anything can be "money", if they just believe in it. Having a hole like coins? In 1997, Zaire’s (now the Democratic Republic of the Congo) dictator Josepeh Sese Seko Mobutu was finally overthrown. 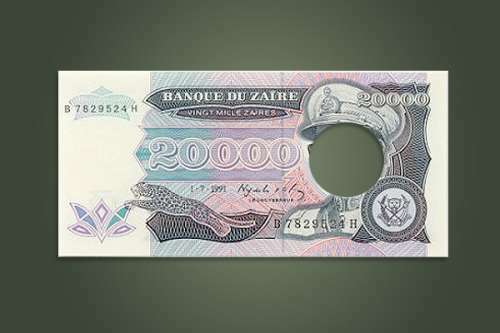 As his face featured on the country’s bank notes, the new government simply punched out Mobutu’s face out of their existing currency and continued to use it until new currency could be printed. Portugal's first paper money was introduced in 1797 by the government.5 Denominations issued until 1807 included 1200, 2400, 5000, 6400, 10,000, 12,000 and 20,000 réis. 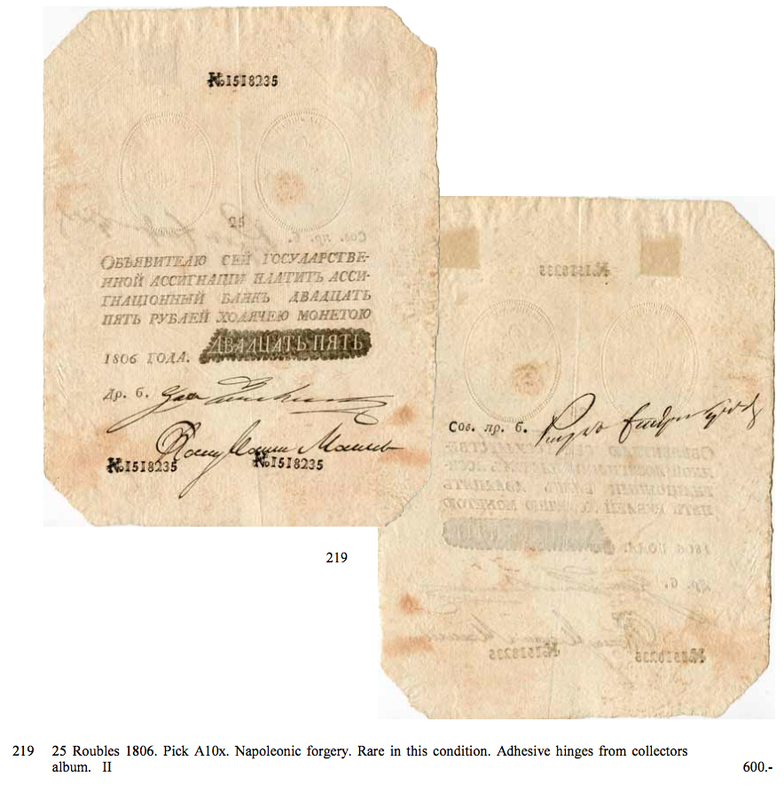 Some of these notes were revalidated for continued use during the War of the Two Brothers (1828 to 1834).5 From the 1820s, several private banks issued paper money. 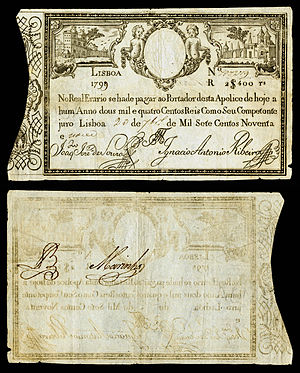 The most extensive issues were by the Banco de Lisboa, whose notes were denominated in both réis and moedas, worth 4800 réis. 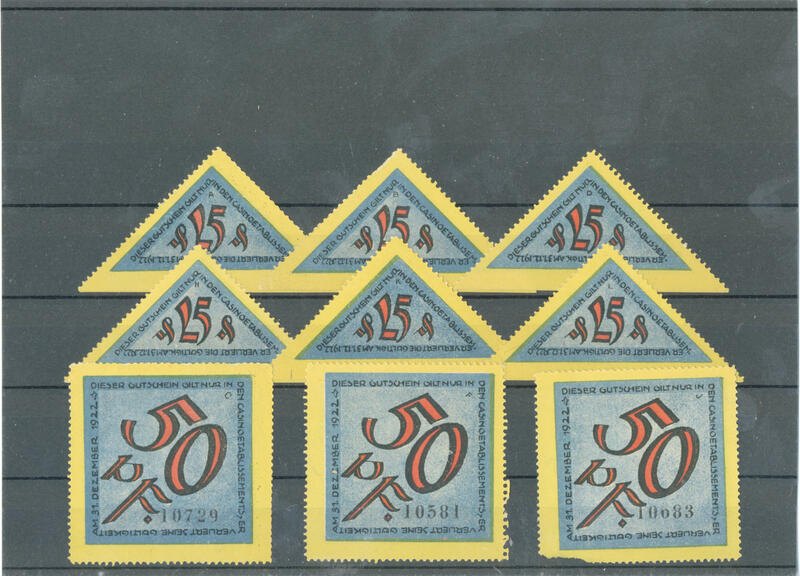 This bank issued notes for 1200 and 2400 réis, 1, 4, 10, 20, 50 and 100 moedas. The Banco Commercial de Braga, Banco Commercial do Porto, Banco de Guimaraes and Banco Industrial do Porto also issued notes, with bearer cheques issued by a number of other banks between 1833 and 1887. In 1847, the Banco de Portugal introduced notes for 10,000 and 20,000 réis.6 5000 réis notes were issued from 1883, followed by 50,000 réis in 1886. 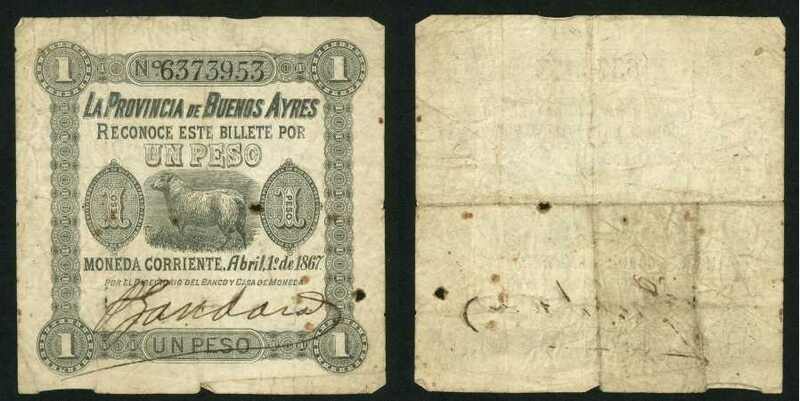 In 1891, the Casa de Moeda introduced notes for 50 and 100 réis,7 and the Banco de Portugal introduced notes for 200, 500, 1000 and 2500 réis, followed by 100,000 réis notes in 1894. 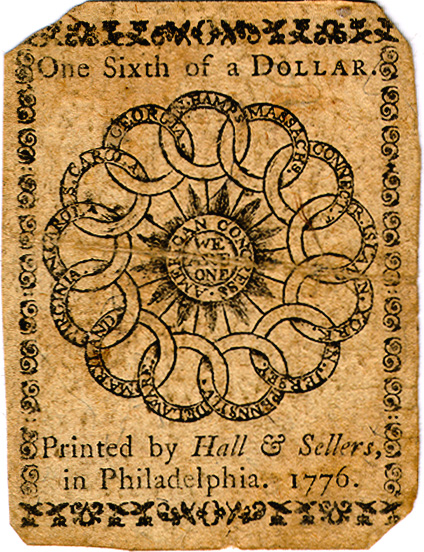 And early American banknotes are weird as well. Signer: Robert Tuckniss (in red ink). Size: 80 x 60mm (front border design: the vertical dimension is 78mm while the horizontal border is trimmed on our example; back border design: 74 x 55mm). Comments: Numbered and signed in red ink. The sundial with the "FUGIO" legend and "MIND YOUR BUSINESS" motto appear on the right center of the front. 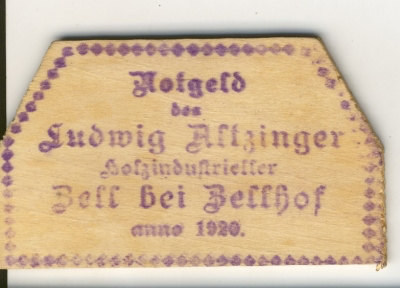 In this fractional denomination, one ornament appears in the upper right corner of the sundial frame; this is keyed to the denomination as each mark equals 1/6th of a dollar. In the right border cut "CURRENCEY" is misspelled. The back shows the thirteen linked rings representing the colonies and the legends "WE ARE ONE" and "AMERICAN CONGRESS". Paper contains blue threads and mica flakes. Provenance: Purchased through the Robert H. Gore, Jr. Numismatic Endowment from the EANA mail bid auction of 1/13/96, lot 278. 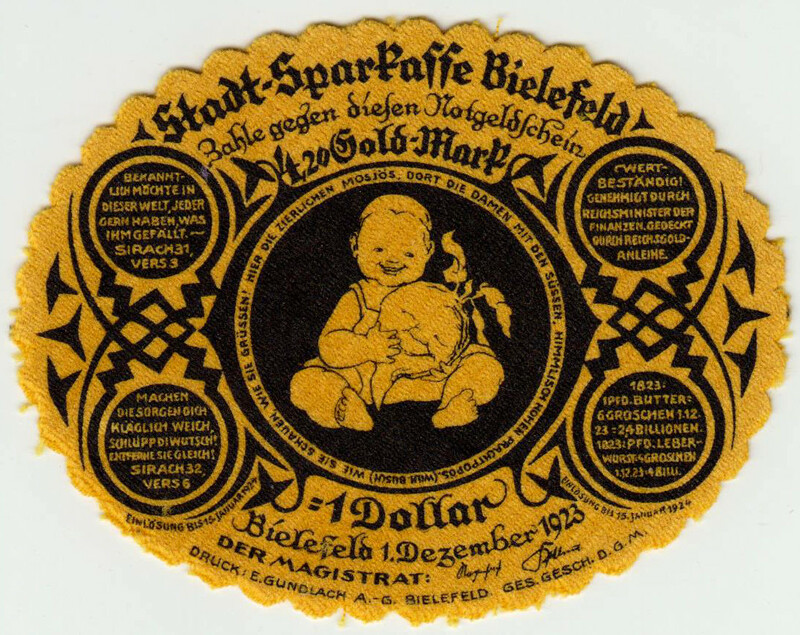 If you insist on "designed and issued that way" (instead of 'remained in circulation') then I guess only the types of Mobuto and Soviet holes count (they were re-issued in that way), and only the paper-like Notgeld shapes count. Round and oval from the start, sometimes. That would make 1914–1923 pretty much the timeframe where to look for more examples (if we do not go much further back). "Notgeld: Der schöne Schein", Spiegel, 2008. Although the material is in both cases not even paper, the first was worth and intended to stand in for paper. Here are a couple of square banknotes. The first one is also possibly unique in that it is one-sided. 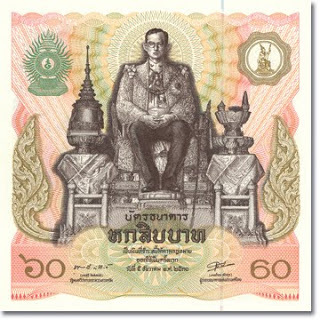 Thailand has also issued a square bank note. This one is from 1987. The site Numisbids, under the category 'Emergency Money' has several examples of round, octagonal and triangular money in addition to the ones already mentioned by LangLangC. Some of these may qualify as paper money but not, I think, as banknotes. 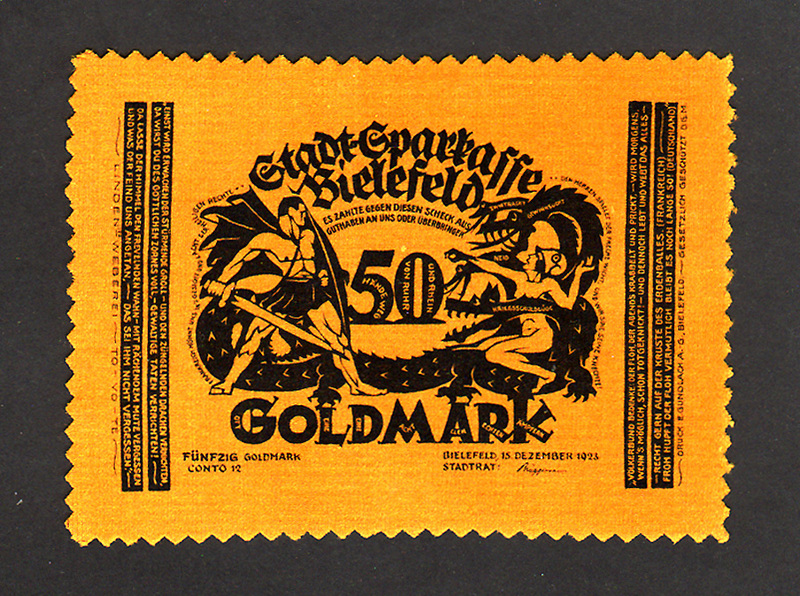 As the OP mentioned both banknotes and paper money in his post, here is an example from Germany. 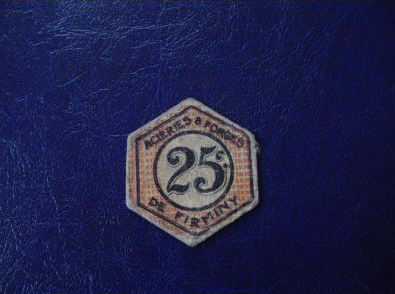 Of additional interest, in France, monnaie de nécessité (emergency money) was sometimes issued printed on cardboard between 1914 and 1923. It has been pointed out in comments below and elsewhere that a square is a rectangle. Technically, this is true, but (rightly or wrongly) in common usage this is not a hard rule and there is more than one definition for a rectangle. The Cambridge Dictionary (American) defines a rectangle as "a flat shape with four sides and four 90° angles, with opposite sides of equal length and two sides longer than the other two". The Oxford dictionary says (for ‘rectangle’) "A plane figure with four straight sides and four right angles, especially one with unequal adjacent sides, in contrast to a square." The Collins dictionary (American) says a rectangle is, "1. any four-sided plane figure with four right angles, 2. any such figure or shape that is not a square; oblong". One candidate seems to be some 1945 Finnish banknotes seem to have been near-squares. From what I can see they are still rectangular though, if an unusual ratio. Unfortunately I cannot find dimensions to be certain. Maybe a little out-of-the-box thinking is called for. There was very little specie (i.e. precious metal coinage) in Britain's North American colonies, so throughout most of the Colonial period, tobacco was money in the big tobacco-producing colonies of Maryland, Virginia, and North Carolina. This was not a mere commodity trade -- colonists went so far as to use the "pound of tobacco" (worth about 3s) as the monetary unit. 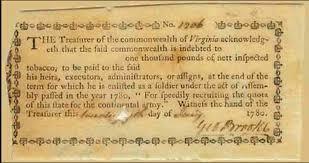 Debts were recorded, taxes and fines were levied, and other goods were recorded in pounds of tobacco. The tobacco is a stand-in for specie, just as paper money is. Payments could be in thousands of pounds of tobacco, which could be difficult to carry around, so payments and debts were often just ledger enties or warehouse receipts. Tobacco prices back in England could vary widely, and so did the prices of imported goods. The receipts were typically for fixed amounts qnd couldn't be "broken" the way a piece of eight could. 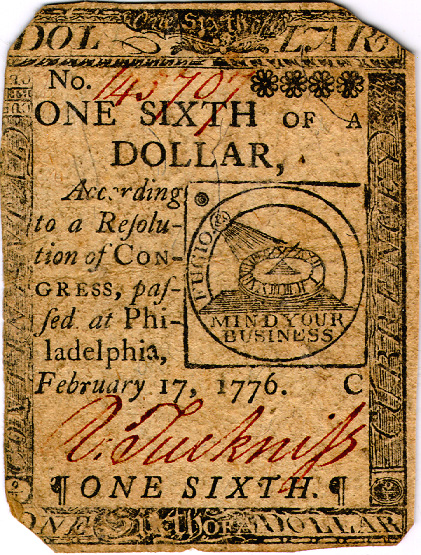 So, individual colonies began issuing paper money. Not the answer you're looking for? Browse other questions tagged currency or ask your own question. Were there established “denominations” for coins of different metals in ancient times? Can someone identify this banknote? 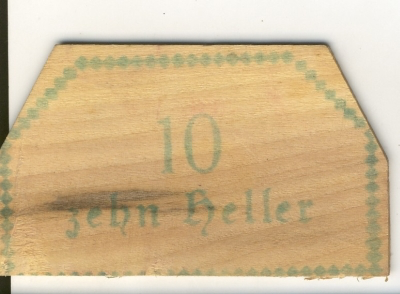 What era is this German 10 DM banknote from? Were there any ancient civilisation that functioned without currency or bartering?